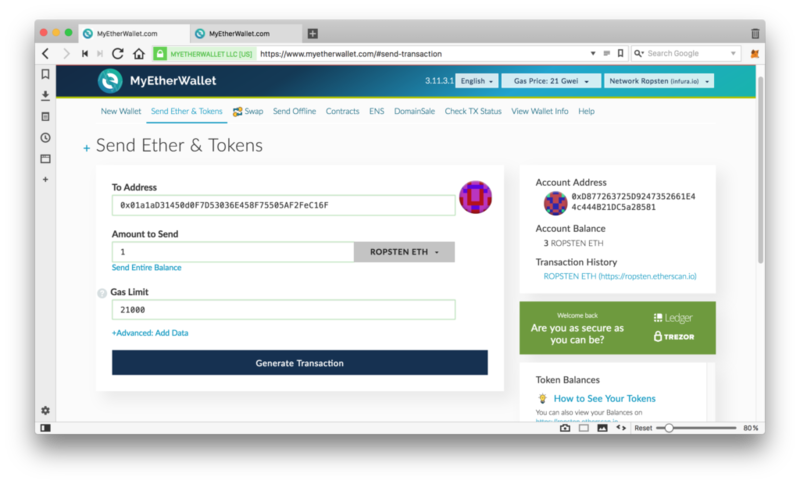 In this article, we’ll go through the process of generating your first Ethereum wallet and sending and receiving ether through the MyEtherWallet interface. 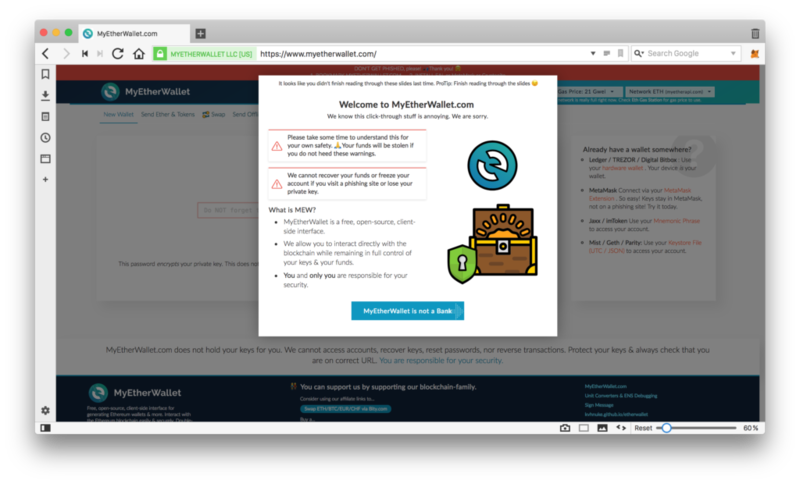 This introduction to MyEtherWallet was originally published at Bruno’s Bitfalls website, and is reproduced here with permission. There are many ways to interact with the Ethereum blockchain. 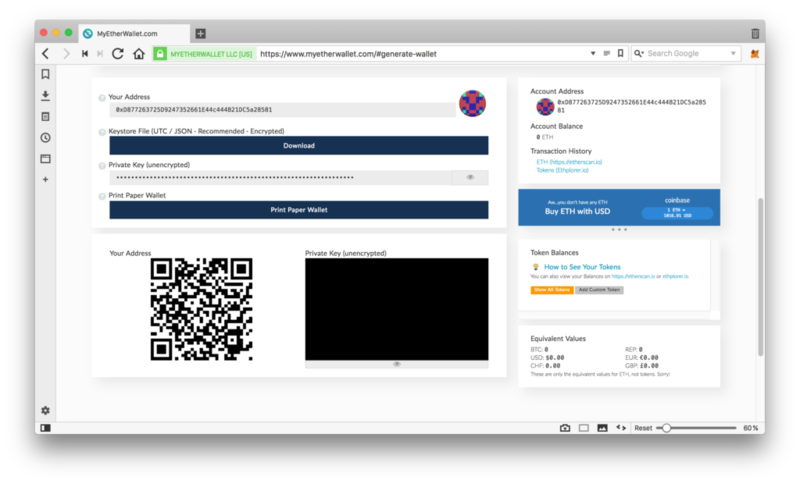 In this piece, we’ll be using MyEtherWallet (MEW). Note: After opening the site, please bookmark it so you never have to paste it into your browser again. There are many bad people who want your ether, and they’ve bought domains similar to the domain of this site hoping you’ll fall into that trap by mistyping! Immediately after loading, the page will display some warnings about them not being a bank and basically not being able to help you if you lose your funds because they don’t have access to them. The gist of it is that you’re responsible for your own funds. The address is immediately generated in the background, but MEW won’t let you see it yet. For as long as you haven’t saved the Keystore file somewhere safe, you cannot proceed. Click Download Keystore File (UTC / JSON) and store it on a USB drive, then hide it from curious family members. The file will be called something like UTC--2018-01-26T10-39-56.592Z--d877263725d9247352661e44c444b21dc5a28581. The first part is the date of creation, the second is the address itself. After you’ve stored it safely, the next screen will display the private key. Very imporant!! : the private key is equivalent in access level to the file you downloaded previously. Both can be imported into wallet software and used to unlock an address to spend money on it. But there is an important difference: the private key does not require a password! If you enter a private key into another tool like MetaMask, the address will immediately become unlocked without a password and can be used for sending Ether and tokens. If you import the previously downloaded file into any wallet software, it will require a password before letting you access it fully. Therefore, it’s safer to only keep one method around: either store the file and remember the password, or store only the private key in a very secure location. Destroy the other method. The fewer ways to access your wallet there are, the safer the money is. 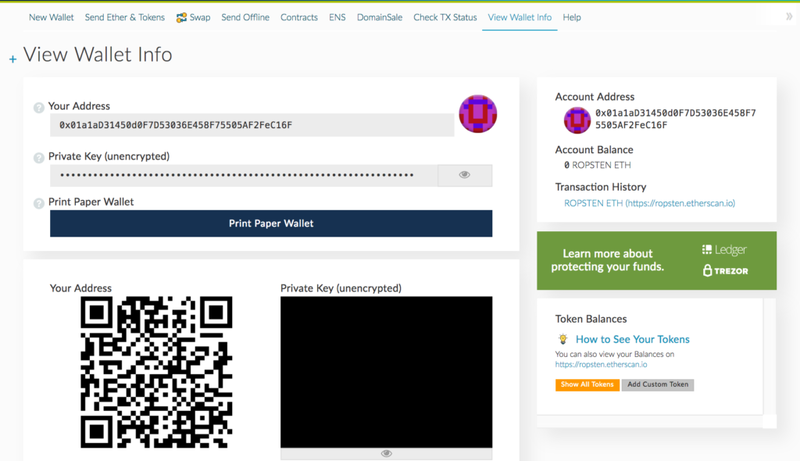 You can generate a Paper Wallet on the same screen. This will open a new tab with a neatly generated printable layout of two QR codes. One is the public key — the address to which you can send funds and tokens — and the other is the private key mentioned above. 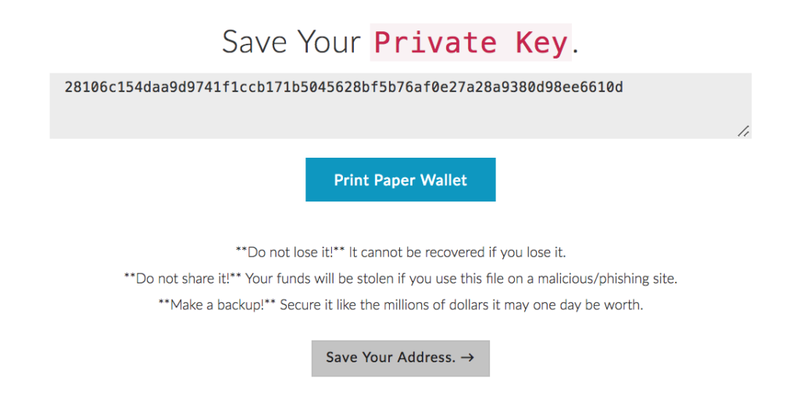 If you’re planning to use this address for long-term holding of ether, it’s smart to print it and store it in a safe as if you had a bond or a big wad of cash. Picking the Keystore/JSON file will provide you with a form through which you upload the file you downloaded previously. You’ll then be asked for a password. Picking a private key lets you paste the private key directly into the field, unlocking the address for use. 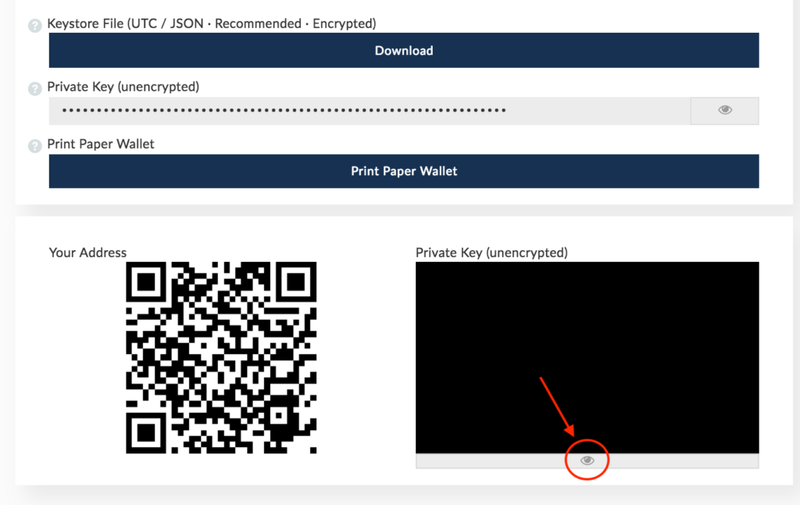 This interface lets you print the wallet again if you lost or destroyed the previous one, or to re-download the JSON file if you lost it and accessed the wallet with the private key. The QR code for the private key can be read by clicking the eye icon under the black rectangle in the bottom of the screen. On the right, you can see your account’s balance: 0 Eth. A little lower you can see the Token Balances frame, which shows you how many of which tokens you have. Because of a large number of available tokens out there, you first need to click Show all tokens to load them. This screen is visible because you’re on the View Wallet Info option, to which MEW automatically redirects you after creation. When sending tokens or ether, the option to use is Send Ether & Tokens. 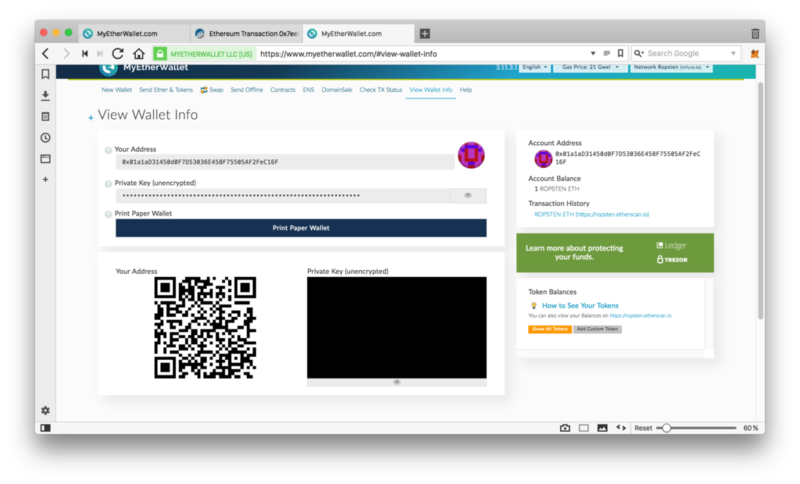 On the View Wallet Info screen, the QR code in the lower left is the address to which tokens and ether can be sent. The value of the code is equivalent to the value in Your Address at the top, and the Account Address value in the right sidebar. Pick any Ropsten. The screen will refresh and you’ll have to re-enter the wallet. 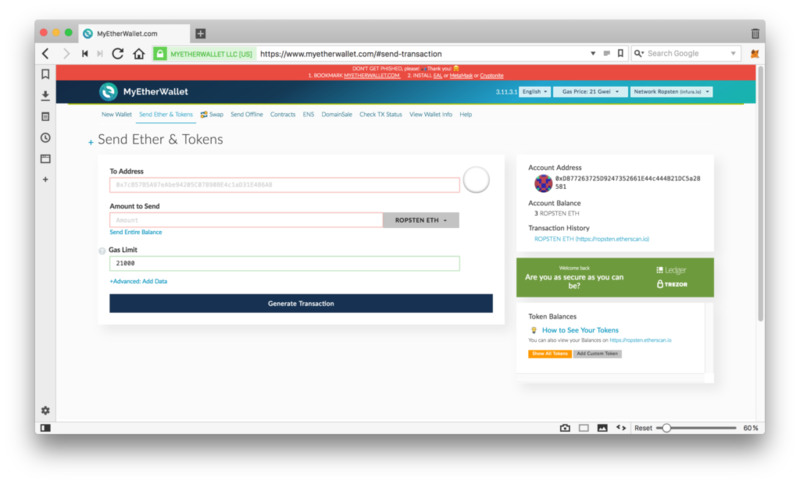 After re-entering via the Send Ether & Tokens tab, the interface will be a little different. No QR codes and the balance will be in ROPSTEN ETH, not ETH. 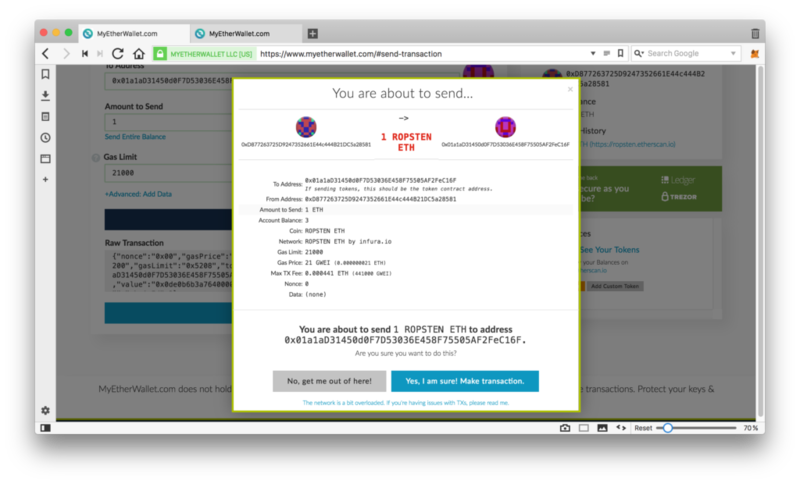 In the recipient field, enter your wallet’s address. Copy it from the Account Address part of MEW. The Ether should arrive within a minute or two, depending on how busy the testnet is. Now let’s send some Ether. In a new tab open MEW again and generate another wallet, following instructions from before. 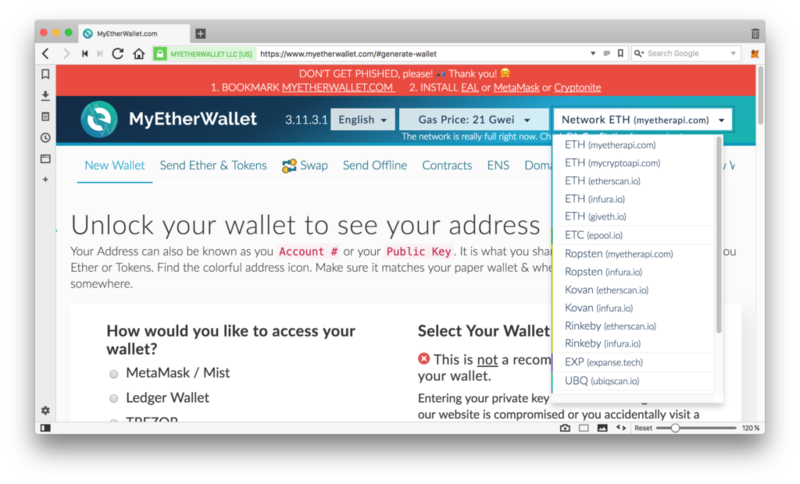 Copy this newly generated address’ public key (Account Address) to the To Address field of the original unlocked wallet with test Ether. Set the amount to less than maximum and click Generate Transaction. After it’s generated, confirm it with Send Transaction. Confirm the sending. 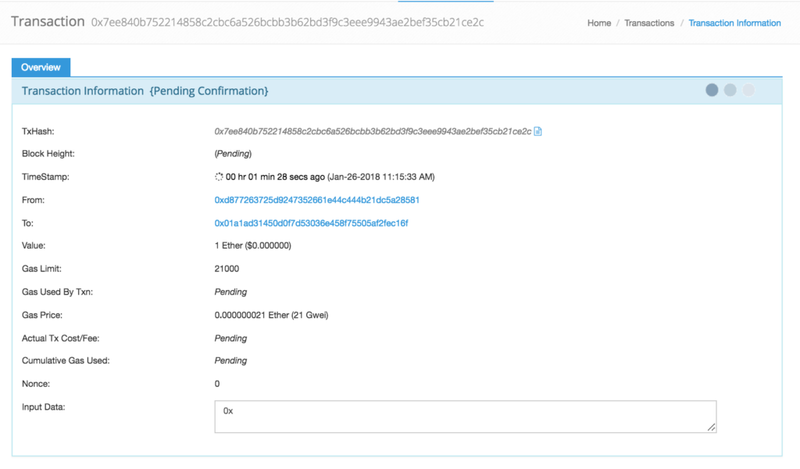 After sending, a green confirmation message should appear at the bottom of the screen with a Verify link which lets you look at the transaction on Etherscan, Ethereum’s most popular block explorer. 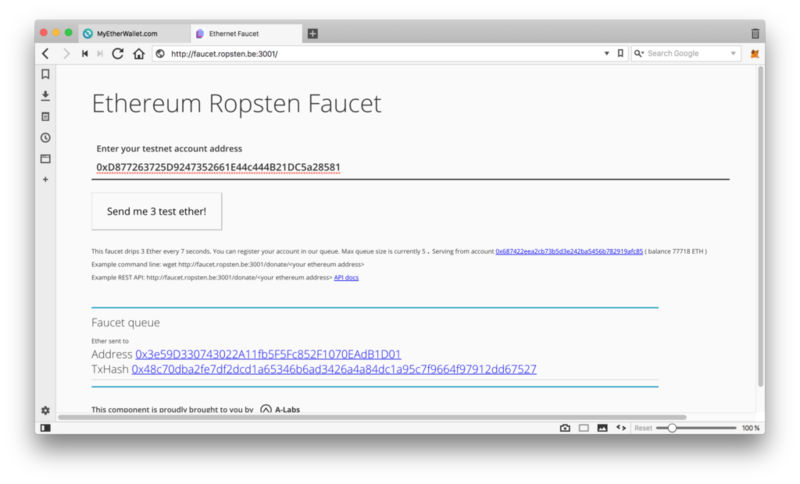 Etherscan has access to the Ropsten network and can inspect it. Pending means the transaction is still being processed. The higher the gas price, the faster it turns into Success. Once it’s successful, the ROPSTEN ETH state of the second, new address, will change (sometimes a re-unlock is necessary so MEW registers the changes). But while MEW is a pretty safe option, nothing can match the safety of hardware wallet like Ledger Nano S. Seeing as MEW’s interface can seem a little complex, there’s a simpler alternative as well — MetaMask.